A mere provincial, I began flash fiction late in 2007: work appeared first @ Delicious Demon (archives now closed), then @ Language Is a Virus (archives now closed). 2010 and 2011: appeared @ Gone Lawn Journal/Gone Lawn Excavation Project and @ Metazen (archives seem closed as of December 2014) and as of December 2011 here @ Fictionaut. February 2012: @ Dead Mule School. March 2015: @ The Miscreant. Took to verse unaccountably in 2016. Flannery O'Connor answered as well as any: "Because I'm good at it." Naturally, I don't write as well as Cousin Flannery, but that's her fault, not mine. While she mastered the short story to get the ordeal of writing over as promptly as possible, flash and verse (haiku, senryu, tanka, and kyoka, at least) offer even more immediate relief. "Once a writer, always an editor." "In life it's always something, in publishing it's always something else." "Applied technology giveth and applied technology taketh away: blessed be the name of applied technology." Authors: Juvenal. Lucian. Dante. Villon. Machiavelli. Marlowe. Burton. Vico. Swift. Poe. Gogol. Dostoevsky. Maupassant. Jarry. Twain. Bierce. Saki. Akutagawa. Čapek. Bulgakov. Kharms. Faulkner. O'Connor. Waugh. Simenon. Books: in addition to those represented by the folks above, some recent reads and re-reads: Karel Čapek/The Makropulos Secret; Edward Corbett and Robert Connors/Classical Rhetoric for the Modern Student; P. V. Glob/The Bog People; Eugene Ionesco/Rhinoceros; John le Carre/Smiley's People. Thank you, Edward, for your kind support of "Digging a Hole to the China Sea" and "Marcel Unchained". Kind of you to see my silly piece as worth stealing. Grazi! Добрый вечер, г-н Странный. Я недавно "здесь"... собираюсь читать и быть читаемый. Eamon Byrne - мой товарищ на этом сайте, великолепный писатель но все ждут, чтобы он читал. Bonjour! Thanks for your comment on "Etienne's Voice". And thanks for the encouragement and for the friendly post on my wall. you'll dig Calvino. Check out Jorge Luis Borges, too, if you haven't. Just read "A Book to Read the Lights By". LOVE that. How droll and smart and utterly original. Hey s, thank you for finding my rat tale and commenting on it. Much appreciated. Also saw a piece of yours at Metazen. Glad to see you around! Hey! Glad to see you here. Going back to bed now with a throbbing jaw, but I'll come back later to read. 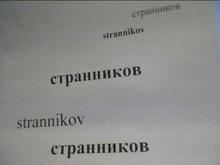 You must log in to write on strannikov's wall.